Bartram's Travels, frontispiece. Bartram completed his expedition in 1774 and circulated his account among friends, but his book was not published until 1791. Library of Congress, Prints and Photographs Division, LC-USZ62-95229. While Bartram's descriptions seem naïve today, in the eighteenth and nineteenth centuries they were celebrated as an image of man's ideal nature. 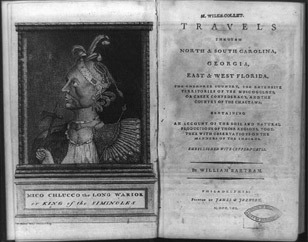 His passages on the Seminoles particularly influenced the English Romantics Samuel Taylor Coleridge and William Wordsworth. In fairness to Bartram, it should also be noted that he met the tribe during a golden age and based his observations on a warm, personal experience.